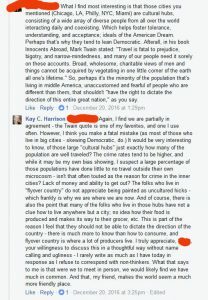 This has been brewing in my mind for several weeks, and the post that inspired me to bring LBF out of the cave in which it has been hiding for the last few years. The Press (or as I like to call them – Pundits Rejecting Every Sensible Source) and the left are so bound up in their own hyperbole that they cannot see or even comprehend their own prejudices. 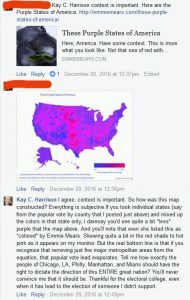 Back in December, I had a FB conversation with a stranger based upon comments left on a conservative writers’ site. It really brought home to me just how wrapped up they are in their own rhetoric, and that it’s danged (yes, good Southern expletive) near impossible for them to see beyond it. 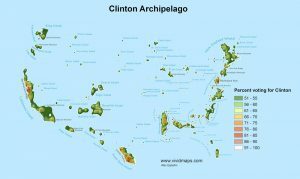 I started by sharing a map created by Alex Egoshin called the “Clinton Archipelago” which shows precisely whence within the US the bulk of her votes came. Sadly, the PRESS doesn’t seem to be “getting it” any faster than the left, and indeed are fomenting even more dissatisfaction among those who believe only what they hear from CNN, et al. The establishment republicans such as has been/never was John McCain and Lindsey Graham are little better than traitors. So entrenched and desirous of keeping their long-standing place at the government trough that they’ll do/say just about anything to keep their position.